Help, I’ve started a business and I’ve got problems. For many, it’s the American Dream to start your own business. Okay, if you’re in Europe, Asia, Australia or other countries besides the USA, maybe it’s your dream, too. Sadly, for too many the dream turns into a nightmare from which there seems no escape. 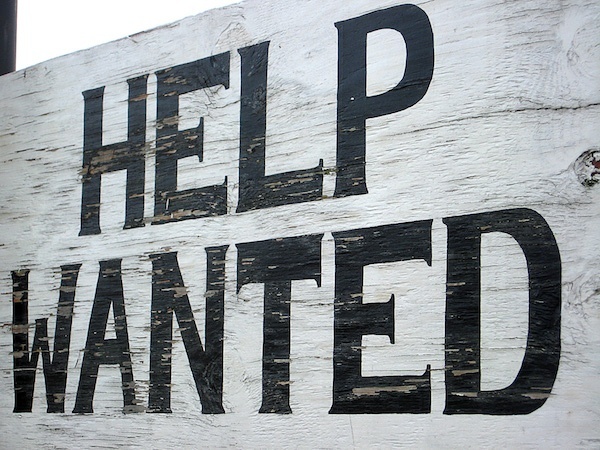 The HELP WANTED sign may not indicate the need for an employee, but rather the need to break free. Carol Roth and a few others have written about the need for people to think soberly about what they want before embarking on a chase that may not ideally suit them. I agree with Ms. Roth that entrepreneurship isn’t always the best dream for everybody. The failure rate continues to be extremely high. According to Statistic Brain the rate of failure among startups increases over time. You’d think over time a business owner would become more accomplished and break through to that wild, crazy success we all hear about and dream of. Yes, it can happen. But are the odds favorable? No, they’re not. And of course, I am speaking in general terms. Every industry is different. Markets are different. Timing and skill play major roles, too. With all those moving parts, success is far from guaranteed. It’s ironic that many people start their own business because they don’t want to work for somebody else. Unfortunately, they wind up working for far more people than they’ve ever worked for before. Maybe now they work for the credit card company where they’ve racked up lots of debt, and the friends or family members who have loaned them money, or a bank. And then there are the customers who demand more and more. Maybe they’ve got partners who also have expectations and demands. The list keeps growing and over time they realize that life on the J.O.B. with one boss was far simpler. Others, hoping to craft work that more rewarding than their old job, find their checking account dwindling, savings exhausted and income dropping lower and lower. Trapped, they despair about what to do. What can you do if your business isn’t what you dreamed? What can you do to fix your own small business? No, I’m not going to start by telling you to shut it down. That’s an option and I’d be remiss if I didn’t mention it, but that’s one of the 5 things I want to talk about today. And I’m not going to tell you it’s cowardly to quit. It’s a viable option that every frustrated business owner must carefully consider, but our goal today is to help you find solutions to fix your business. 1. Triage yourself and the business. I’m not talking about going back to exam why you started your business or any other mumbo jumbo touchy-feely thing. No, that ship sailed. Now it’s time to take a hard look at what’s wrong. Where is the pain? What’s the source of the suffering? Is it not enough revenue? Or profits? Is it no life outside the business? Is it delivery to customers or the execution of whatever service/products you provide? Think about the trifecta of business building that serves as my focus here at Bula Network: a) getting new customers, b) serving existing customers better and c) not going crazy in the process. In my experience of triaging businesses, I often find 2 of these are in play when the owner’s misery factor is sky high. What about you? You can’t fix what ails you until you first properly diagnose the problem. And don’t get ahead of yourself. I’ve seen people try to fix problems that weren’t really the problem. This is not the time for knee-jerk reactions. Come to think of it…is there ever a good time for the knee-jerk reaction (except when the doctor is testing your reflexes)? Give this some sober and serious thought. Bring your team together, if you’ve got one. If you don’t, bring together the people who help you in your business. Collaborate on the problems as you see them. Do others see what you see? Feel what you feel? Is this problem just specific to you? It may be IF it deals mostly with the fact that you never see your family. Focus on THE problem. Don’t scatter shoot and list 12 problems. Think about THE PROBLEM. Narrow it down to the one thing that is causing the most pain. If you go the ER with life threatening injuries, the doctors aren’t going to worry too much about your headache. First, they have to save your life. They’ll worry about the lesser problems later. You have to do the same thing when you triage your business problems. Part of triage is determining the severity of the problem. Is it life-threatening or mildly aggravating? Just because it’s not life-threatening doesn’t mean it’s not urgent or important, but it does mean you can likely take a bit more time to examine it. You’ve got to have a clear understanding of the nature of the problem before you can ever hope to find a remedy. 2. Find the root of the problem. Now that you’ve identified the problem, you have to get to the source. When the ER patient is bleeding profusely, the doctors know the problem is excessive bleeding. Well, that’s not enough information to fix the problem. It’s great to have identified the problem, but that won’t fix it. You’ve got to find out why this is happening. What’s really going on here? Depending on the nature of the problem this can be quickly identified or it can be tough as nails. Our ER patient may have suffered a stabbing. Pretty obvious problem. But what if the bleeding is internal? No outward signs of injury. Much tougher. It’s gonna take some time to find the problem if the bleeding is internal. So it is with your business woes. Maybe it’s something very obvious like a lack of sales (i.e. bleeding), but why? That may not be so obvious. Is it pricing? Is it your offer? Is your quality or lack of quality? Is it marketing? Is it your positioning? Why aren’t people buying? You’ll have to spend hours and days mulling over that one. There’s no time like the present. Start mulling. Maybe it’s something else, equally obvious. You’re working 100 hours a week and your family is a mess. Why are you working 100 hours? This problem is far more common than you may think. And the reasons vary wildly. I’ve encountered business people who declared how miserable they were working 100 hours a week, but on closer examination they’re facing the reality that they do it because they want to. Yes, they’re miserable, but in some cases, they’re more miserable at home. They’ve conned themselves into thinking the business is wrecking their family, but they’re just using the business as an excuse. They’re wrecking their family because they’re more in love with their business than their family. You’ve got to see the real problem and not just the perceived problem. This is why you likely need help to identify the real problem. Seek the wise counsel of people familiar with the situation. Listen. Really listen. Think about it. You can’t fix it until you get to the source so this step can’t allow any shortcuts. Dig until you find the real reason you feel trapped. 3. Act now, but consider multiple remedies before deciding on the best long-term fix. If a person is bleeding we use any method possible to stop the bleeding. Pressure. That’s the main goal early on. Apply pressure and stop the bleeding. It’s life saving, but it’s not a remedy. It’s just an urgent act necessary in the moment. It buys time so a more permanent fix can be performed. That’s how you’ve got to view your business problem. In step 1 (triage) you’ve determined if your problem is life threatening to you or your enterprise. Cash flow is a frequent problem I encounter. Few things are as urgent as a lack of cash flow. Your business needs cash. Every business does. When it runs out, or runs low, panic can overrun you. A short-term fix might be to sell some things to create some quick cash. That’s immediate pressure on the wound, but it won’t fix the problem for long. What must be done right now so you can buy some time? Focus first on that. Then, as quickly as you must, exam the various fixes you might perform. Almost every solution has an upside and a downside. Again, I’m going to encourage you to avoid going it alone. Seek the input of others. Yes, you’re the leader so the final decision is in your lap, but don’t be stupid thinking you alone have to solve this. Weigh your choices before settling on the one you think is best. And that means you need to pick one and commit to it. Whole-heartedly. 4. If it’s not working, change it. If it is working, keep doing it. Pay attention to the symptoms. Look for improvement. Also be watchful for a lack of improvement. You’re the doctor and the health of your business is your responsibility. Don’t take your eye off the patient. Just because you’ve gone all in on the best long-term fix doesn’t mean you have to remain all in if new information changes your mind. For instance, a business suffering a cash crunch quickly sells off some excessive inventory at a reduced margin. They’ve bought themselves a month or two. Great. Now they huddle about how to avoid getting into this pickle again. Three suggestions are on the table and the owner selects the one he thinks is best. Two weeks in, it’s clear that this strategy isn’t going to work. It’s time to abandon that strategy (or change it). He can’t be reluctant to alter the course when the strategy appears to be failing. Don’t fall in love with a single solution. Be willing to change based on the outcome. You need a good outcome. You need to find a remedy. It’s either working or it’s not working. Or maybe it’s not working well enough. Then be fearless to try something else. Remember, you’re looking for the best long-term fix possible. That may require a few changes in medication. Do it. If it works well, then keep doing it. Keep putting the fix on trial for its life. 5. Change the behavior (actions) that caused the problem. That stabbing victim that came in the ER is a gang member. He’s living a high risk life. He’s gonna get stabbed again if he doesn’t make some big changes in his life. It’s just a matter of time. Your business is no different. The problem that trapped you can be fixed, but that doesn’t mean it’ll stay fixed. If the crisis is averted, great — but your work is not done. Maybe your life has gone to you-know-where-in-a-hand-basket. You endured the crisis and managed to get some “balance” back into your life. Unless you have made some lifestyle changes that problem is sure to creep in again. Don’t assume your work is over simply because the crisis is over. A bad sales process can create poor sales, resulting in poor cash flow, low revenues and low profits. In a moment of crisis, a few big sales might be generated out of sheer willpower and determination, leaving the poor sales process in place. But, with the crisis ended the company can resume business as usual. In time, they’ll be right back where they started…and what if they can’t make a few big sales this time? The remedy needs to be a longer term fix, but now you’ve got take the time to investigate what went wrong so you can get busy making the bigger changes necessary to provide growth and efficiency for your business (and your life).